Introducing Air Fix styling spray, a strong hold level 5 hairspray, that will allow you to rework your style until you complete this seasons must-have look. The anti-frizz formula, gives long-lasting control of the look of frizz. You can achieve that sleek look, but with the strong hold, which will ensure your style will last the night. Apply to dried or slightly wet hair. If you have a style that requires added lift, spray directly on to the roots. To control the look of flyaways on towel-dried hair, spray Air Fix into your hands then gently wipe over flyaway hair. 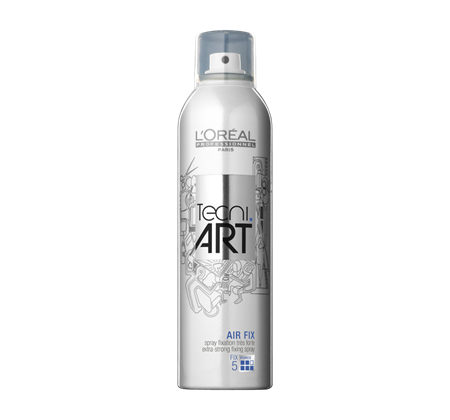 Buy L’oreal Professionnel Tecni.ART Air Fix Spray 250ml on-line today at Riah Hair.